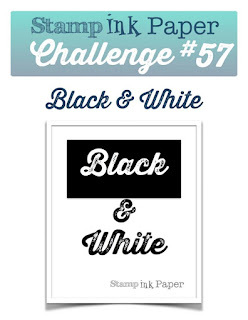 Tina's Crop Shop: SIP Challenge #57 - Black and White! Hello and Happy Tuesday! Hope your week is off to a great start! I'm back over at Stamp, Ink, Paper this week with my Black & White design team card. I knew this would be a fun challenge but it mostly became just a challenge.. not sure why??? For some reason I struggled this week and constantly wanted to add a pop of color but keeping with the challenge guidelines, I fought off my inner rebel and went with just Black and White! Here's what I came up with this week! I LOVE the black and white prints in the Pop Of Pink Specialty DSP so I used those on my Thick Whisper White A2 Card base but I mounted both DSP layers on a thin layer of Basic Black cardstock. Once again I went with one of new favorite Stamp Sets, Grateful Bunch that coordinates with the Blossom Bunch Punch. The sentiment, butterflies and flowers are all from this awesome set! I used my Lots of Labels Framelits Dies to cut out my sentiment and stamped butterflies. I stamped in Black Archival Ink all of the flowers of Whisper White Cardstock and punched them out and then layered using dimensionals in between the layers.